Michigan AI Symposium 2018: details here. 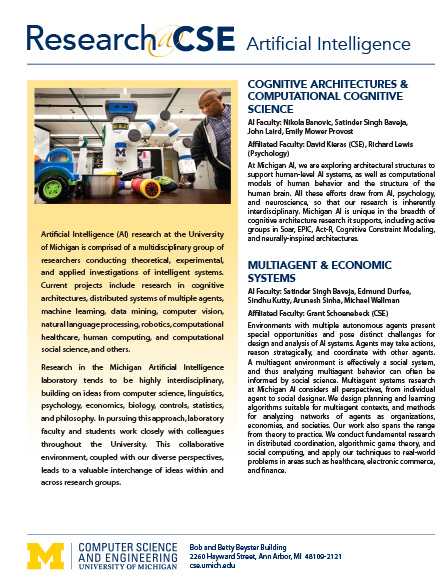 The Artificial Intelligence (AI) program at the University of Michigan comprises a multidisciplinary group of researchers conducting theoretical, experimental, and applied investigations of intelligent systems. Current projects include research in rational decision making, distributed systems of multiple agents, machine learning, reinforcement learning, cognitive modeling, game theory, natural language processing, machine perception, healthcare computing, and robotics. Research in the Artificial Intelligence laboratory tends to be highly interdisciplinary, building on ideas from computer science, linguistics, psychology, economics, biology, controls, statistics, and philosophy. In pursuing this approach, laboratory faculty and students work closely with colleagues throughout the University. This collaborative environment, coupled with our diverse perspectives, leads to a valuable interchange of ideas within and across research groups. This website is a good source of information if you are interested in pursuing graduate studies in artificial intelligence, machine learning, robotics, or related areas. To apply for our graduate program in CSE, please visit our prospective student page on the CSE website.